Where to use HOISKO CLT? Cross-laminated timber is suitable for any kind of construction where wood is applicable. HOISKO CLT is a structural component for homes and other private purposes, apartment buildings and public buildings such as schools, hospitals and sport centers or infrastructure, e.g. bridges. CLT enables easy additional development for example in adding floors. The building component is visual but also easily covered. 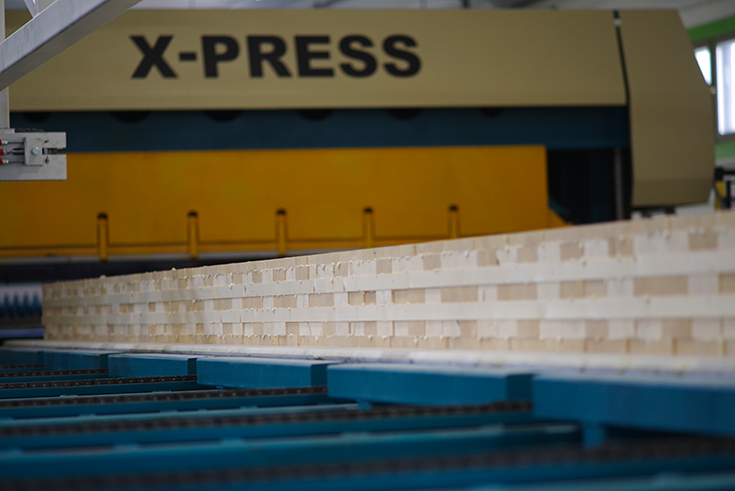 HOISKO CLT slab is manufactured by gluing separate boards in form of a plate and layering the plates crosswise until the desired thickness is reached. The layered slabs, lamellas, are pressed tightly into a CLT building component. 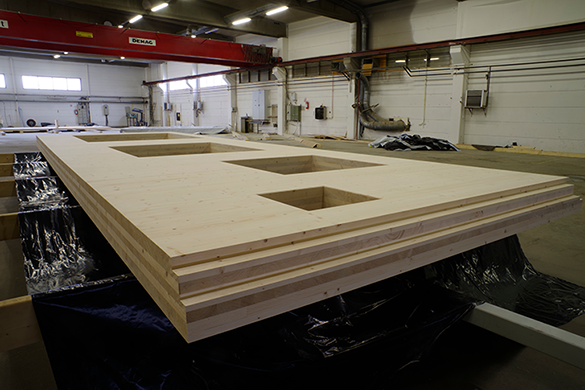 If needed, the CLT slab goes through CNC machining and is finished by sanding and coatings. 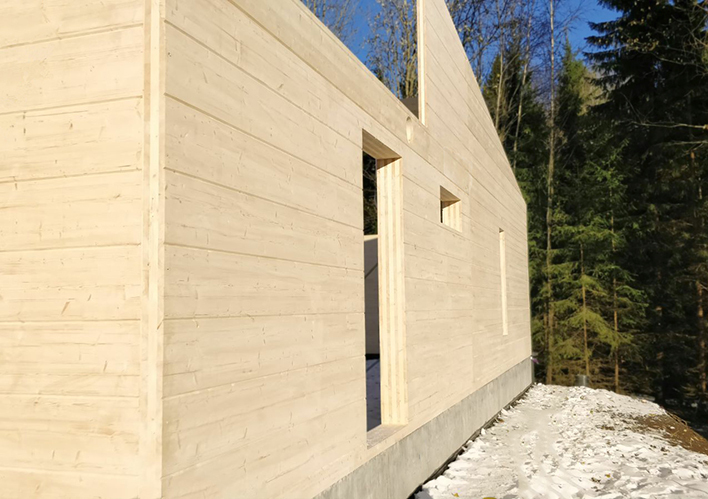 The technical features of cross-laminated timber challenge concrete and steel as the bearing capacity is comparable to steel, yet the weight is lighter than concrete. HOISKO CLT glued edges decrease the crack formation in the seams unlike CLT without glued edges. Therefore, HOISKO CLT has not only visual surface but added bearing capacity. What is more, due the edge gluing HOISKO CLT does not need a separate vapor seal. HOISKO CLT slab without edge gluing is available, however the technical features concerning air tightness and behavior with dampness demanded from the structure are not guaranteed in the HOISKO CLT product. The glue used in HOISKO CLT is ecological, fragrance free and safe non-formaldehyde polyurethane, known from log house production. HOISKO’s cutting-edge gluing technique ensures a breathable building component without a film of glue. The cross lamination and the dense pressure ensure the stability of the structure by preventing the wood’s natural expansion and shrinkage. Therefore, the end product has a precise fit. Again, the tree density affects the CLT structure’s fire safety; compared to timber, the burn and the pyrolysis are slower. Additionally, the surface layer can be treated to non-flammable. The manufacture of HOISKO CLT takes place in a supervised and dry indoor space making dampness non-existent. The CLT building component assembly happens in hours keeping the components dry and the on-site costs low. the proven positive impacts on health and on the quality of living.